Many people connected with the oil industry will be casting nervous glances towards Vienna today where Opec is meeting to set its production targets. But America’s shale revolution means that the price that Opec can command for its oil has fallen over the last few months. Some indexes for crude have fallen nearly 20 per cent since mid-September. This falling price reflects the views of many in the industry that over the next few years the price of oil looks set to decline. The falling oil price has ramifications across the industry, not least in Canada where the cost of extracting the tar sands means that a high oil price is a necessity for survival. The report points out that during the past month a barrel of Western Canadian Select (WCS), the main benchmark used to price Canada’s heavy oil, has averaged just $58. But producers in Western Canada will need to fetch at least $65 a barrel to attract new investments and ensure that current projects remain profitable. 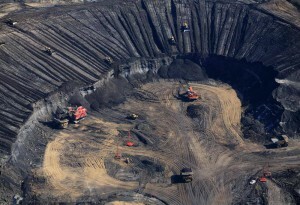 The report also argues that whilst KXL would help ease the export bottle-neck for the tar sands, it is “no panacea”. Mark Lewis, one of the report’s co-authors, argues that, at best, all KXL can do is “shift projects from being unprofitable to being marginally profitable.” He argues that it would be “very risky” to invest in the tar sands today. Bloomberg labels them a “shaky investment”. Moreover, to add to Canada’s financial investment woes, as we have pointed out before on this blog, the carbon intensive tar sands are increasingly been seen as “stranded assets” or “unburnable carbon”: carbon that can never be burnt due to climate change and a carbon constrained world. And Bloomberg has launched the first investor tool that measures the risk of “unburnable carbon”, having become concerned having read previous Carbon Tracker reports. The tool helps investors quantify how climate policies might alter the earnings and stock prices of oil, gas and coal companies. It is a surprise that no one has launched one before now. “People are getting the idea that one of the main risks—perhaps the main risk—from climate change for investors and pension funds relates to hydrocarbon investment,” argues Craig Mackenzie, head of sustainability at the Scottish Widows Investment Partnership, which manages $234 billion in assets. And one of those areas that could lose value quicker than anywhere else due to its high carbon intensity is Alberta’s tar sands.